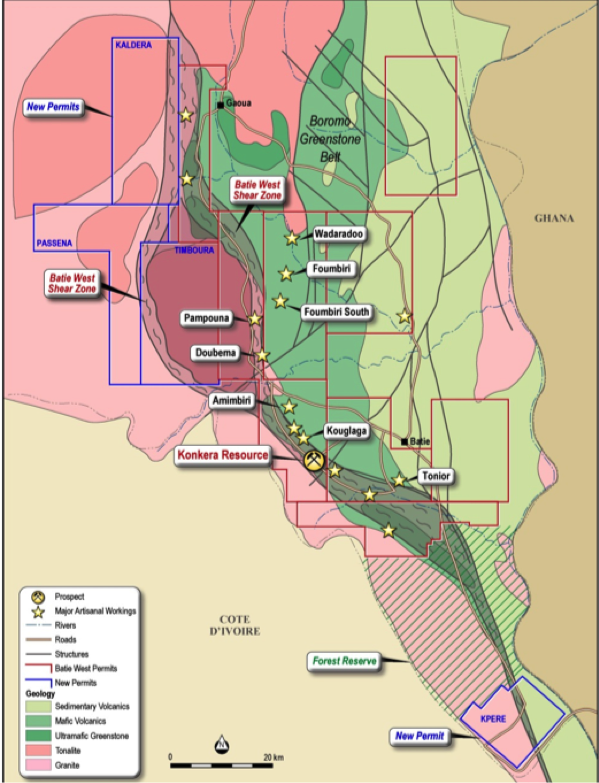 Ampella Mining Ltd (AMX) is an emerging, near term gold producer in Burkina Faso, with current projects located at Batie West such as Konkera, Doubema and Foumbiri. AMX currently has 3.1Moz (Million ounce) resources (JORC compliant) in Konkera while it has two new discoveries at Doubema and Foumbiri. AMX has $61mil cash and is undertaking $30mil aggressive drilling program. Prefeasibility studies (PFS) and Definitive feasibility studies (DFS) are underway and results will be out by 2Q12 and 4Q12 respectively. The picture below shows the locations of their mining operations. Ok. Enough with the intro. Time to talk about why AMX continued to slide, which is what most people are worried about. Just look at its price chart over the past 2 years. Despite all that they’ve accomplished above, its share price remains the same as 2 years ago. After looking through various analyst reports, news and company announcements, the following were some of the issues that caused the price downtrend. Lasted a few months from Feb 2011 to May 2011. The protest started following a dead student during police custody. Other reasons for the protest included rising prices and insufficient salaries/benefits. Riot police and the army later joined in the protests over their salaries and benefits. Throughout the protest, 15 people died. This incident had probably unnerved investors over the rising possibility of the President being toppled or uprisings that could affect the existing mining businesses. However, since then, the unrest died down as the President moved in decisively to quell the rebellion by addressing the welfare of the army/police and people in addition to removing security chiefs and firing 136 policemen involved in the unrest. As long as the President could satiate the anger of the army/police, he will be quite alright. Thus far, protests were in the hundreds only and the demographics of the country (mostly one ethnicity and religion) would discourage major uprisings. There are also concerns of nationalization of resources which I don’t think will happen, as they do not have the expertise to mine and they will not kill the golden goose which contribute substantially to their economy. Having said that, the situation still needs to be monitored by investors, though any disruption to the mining operations is not likely. 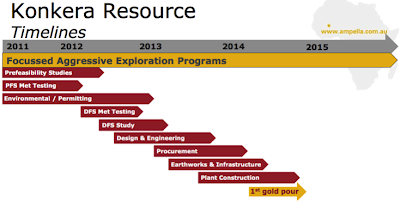 The backlog of gold assays due to lack of laboratory facilities had plagued Burkina Faso’s gold explorers in 2011, and Ampella was no exception. Some of the gold assays for Ampella were delayed as long as four months, causing delay to its resource and drilling programs. However, this would be less of an issue as Ampella had just completed its own $450K laboratory which will significantly reduce any future delays. Lack of funding, therefore the prospects of share placements that could dilute the value of existing shareholders. Ampella had just completed a share purchase plan (SPP) last month which raised $47mil at a price of $1.30/share (Currently it’s only $1.135!!! ), boosting its cash level to over $60mil. 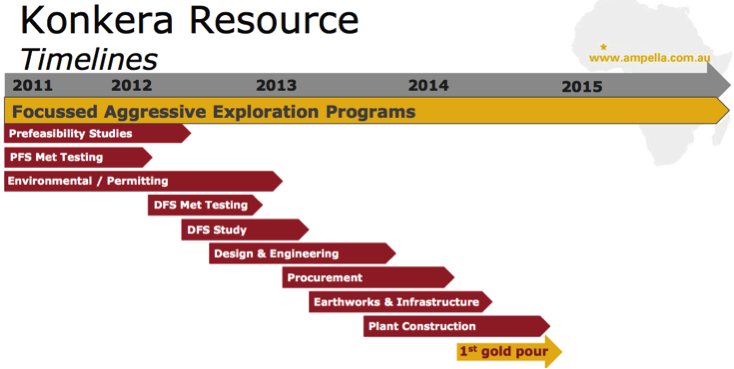 The cash level is able to fund its future exploration ($30mil planned for this year) and feasibility studies (DFS, PFS). Thus, any capital raising via equity will not come anytime soon or perhaps it will be the last one as construction of processing plant after DFS will likely be funded via borrowings. Unfavorable results from metallurgical studies? The metallurgical results released end of Jan 2012 were viewed negatively by the market, causing its share price to plunge from $1.70 to $1.30. The negative view was apparently caused by fear of high operating costs of producing gold as met. studies showed that Konkera Main/East had unfavorable recovery rate at 71% only using ultra-fine grain (UFG), leachwell and float-tail recovery. Konkera North obtained 91% recovery rate using the same methods. This was in contrast to its Kouglaga gold ore recovery rate of 98% via conventional gravity and leaching methods. Thus, to increase the recovery rates, a process known as Albion can be introduced to optimize Konkera’s recovery rate above 95%. The recovery rate could also be improved through tweaking of some of the CIL processes. Overall, recovery rate was at 84% for worst-case scenario and 95% for best-case scenario. The issue here is the additional costs of production and installation for UFG and Albion. According to Dr Paul Kitto, MD of Ampella, UFG is going to cost around 10-15% extra to its cost of production while capital cost of the whole construction will cost around $200mil (normal for such production capacity) for 3 million ton p.a. of ore processing. This should not be much of a concern also as cost of production of gold might only increase by $60-80/oz to around $700/oz (assuming normal cost of production of $600/oz), which can still fetch substantially high profit margins at current gold prices. Yet, the market seemed to have discounted Konkera Main/East as dump as evidenced by their drop in market value by 33% (Drop from $1.70 to $1.14). Did the lower recovery rate of 71% justify the price drop? Konkera Main/East represents about 38% of total resource size of 3.1Moz. Let’s say we use 20% decrease in recovery rate multiply with 38% of 3.1Moz = 235.6Koz or 8% loss in resource. But but but…Market is pricing Ampella as if it had lost all of the Konkera Main/East resource which is ridiculous. In addition, Ampella has two prospects, i.e. Foumbiri and Doubema, which have high-grade resources similar to Kouglaga’s rather than Konkera’s. Currently the company is aggressively carrying out drilling for these two prospects to be added into the existing resources for DFS, of which the high-grade ores from these mines could be blended with Konkera Main/East’s sulphide ores to lower down operating costs. In view of the above, it can be seen that even PIR that has no resources defined yet coupled with GRY that has only 2Moz gold resources, have higher market cap than Ampella that already has 3.1Moz gold resources. Note that when the company already has resources defined, a lot of derisking is done already, thus should have a premium over those which have lesser resources. In terms of EV/Resources, Ampella was one of the lowest among its peers as well. The issues surrounding Ampella had really sold down its share price to unjustifiably low levels. With Burkina Faso’s political situation returning to stability, reduction in delays of drill assays, ample cash of $61mil to support its operations (thus little possibility of SPP) coupled with PFS (To be out in 2Q12) which might be not as bad as anticipated by the market, Ampella’s share price could be poised for a rerating. Assays results from their aggressive $30mil exploration program in addition to the likely upgrade of its resources will further lift Ampella’s share price. With the resources, cash and progress that Ampella has right now, its market cap should be more than $400mil, or $1.75 per share. Furthermore, the upcoming PFS, drilling assay results and upgrade of resources will likely push its target price even higher. Analysts’ consensus for its target price remains above $2.00.